Teaching your children to invest is a very noble goal, and it can be as hard and serious or as fun and easy as you want to make it. Financial planning is a life-long process, and the sooner they get a grip on it, the better. So, what can you do to help prepare you children to invest properly? I suggest doing a little gardening project at home. What are some basic principles about investing? Risk and reward, diversification, plan creation, implementation, and consistent maintenance—all of these can be found in gardening. Plus, if you teach them the fundamentals of gardening, they’ll also be able to live a more self-sustaining lifestyle if they choose to. Give your children a small amount of money to go pick out some small, live plants to bring home (seeds will teach more patience, though). While picking plants, you can let them explain each of their choices to you and then give them feedback. Do they fall in love with one and want to invest all of their money in the largest or prettiest plant in the nursery? Just because a plant is big or attractive doesn't mean it's hearty or reliable. The same can be said for companies you might invest in. 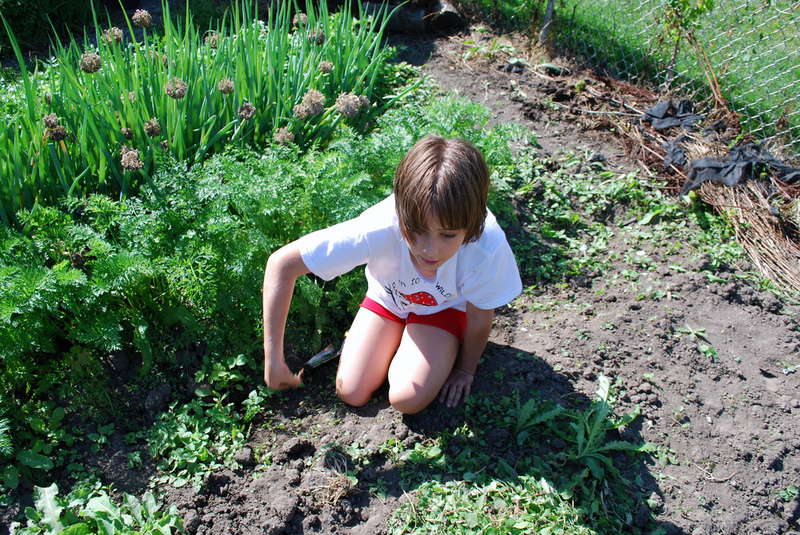 Encourage your kids to chat with the sales person about which plants are recommended in your climate, and which plants will produce the most fruit, seeds, or flowers -- explain to them how you can research plants the same way you'd research stocks or other investment options. Should they just pick one plant, or many? Each one will provide something different, and they'll all grow at different rates. If they pick a vegetable like peppers, those will come up later in the fall. If they pick pretty annual flowers, they’ll get to see the returns of their labor more quickly, but won't be able to use them for food later in the year. Letting them pick two or three of each plant will help ensure the odds that one of each will survive and grow. Plant more than one, so if one plant doesn’t make it, you still have gains. If you pick a flower because you like the way it looks, is it annual or perennial? Will it keep coming up, or will they invest all their time and money in something that will only have very temporary growth? No one said you’re going to give them another boost of income next summer, so choosing a plant that will continue to bloom year after year is a good choice -- much in the same way that a stock might pay dividends multiple times. Let your children pick the watering containers of their choice, be it a hose or some cute pails. Watering and maintaining the garden can be a lot like managing your portfolio. You need to watch carefully what's maturing and growing and what's dying off, making decisions about the garden and what plants to buy next year accordingly. Which plants deserve more of your time and investment? Which plants have been a disappointment? What can you learn about other plants based on these ones? Watching your investment portfolio grow and wane can often help you to decide what direction your investments will take in the future. The more you have your hands in it, the more you'll learn! You must also watch out for any upcoming storms or draught (aka: loss of income, market crashes, and inflation). Unfortunately, you can only do so much to prepare for and respond to these types of uncertainties. The lessons you’ll teach in rolling with the punches when it comes to the weather and its effects will cross over into many different parts of your children’s lives, including their eventual investment portfolios. Well, thank you! I think I may actually be blushing with pride. :) I'm so glad the article connected with you. Great way to start teaching youngsters not only how important to invest in something, but also teaching them to find out what they really want out of their investment ! Thank you, AL. I'm glad you liked the article. The best part about teaching through gardening, too, is that it doesn't require you to teach all the concepts on one day. Kids will naturally pick things up along the way, and you can wait to feed them the juiciest parcels of the lessons on days they're most receptive. What a great find! There's certain poignancy in your analogies. Love this!! this is a great way to teach a new concept to kids! Nice analogy and something really close to my heart at the moment. My daughter is only 9 months old, but I can't wait to start a garden with her. She already loves going outside to look at the plants :) I think that it is important to teach kids that their food doesn't actually come from the supermarket, but going further and teachingg them about the investment of time to reap a reward is a fantastic concept as well!